The best real estate business goals are specific, measurable, attainable, relevant and time-bound. 83 percent of the population does not set goals; of those 83 percent, 92 percent fail to achieve them. Goals for which you set no expiration date are less likely to be achieved. Goals are fuel. Goals are direction. Goals are what push us forward in life. Here, are three (albeit lofty) definitions for the word “goal.” More formally, however, Wikipedia defines a goal as “the object of a person’s ambition or effort; an aim or desired result.” In other words, goals are just the tasks people assign themselves on a daily basis — that’s it. The word goal tends to have a righteous aura about it. People who set goals are “over achievers,” or “those who set goals are superior to those who don’t.” Sometimes, goals are considered threatening or unattainable. But in all actuality, a goal can be as small as promising yourself you’ll do the dishes before you go to bed every night this week. The problem with giving the word goal so much authority is that it turns the idea of goal setting into something so intimidating nobody wants to give it a try. If we can all start to regard a goal for what it really is – nothing more than a daily chore – a greater number of people will prioritize setting goals and, thus, more people will accomplish their personal and professional ambitions. Remember, creating business goals is a great way to realize success on a higher level. As an investor, which real estate goals will best serve your bottom line and how will you go about achieving them in successful and efficient manner? Read on to discover the answer. What Are SMART Real Estate Goals? Did you know businesses that set clearly defined goals are 10 times more successful than businesses that don’t? A Harvard Business University study recently found that 83 percent of the population does not set goals and of those that do, 92 percent fail to achieve them. Number one: why are so few people setting goals? Number two: why aren’t more people succeeding in accomplishing those goals? The reason is simple: because the goals most people set aren’t setting smart. 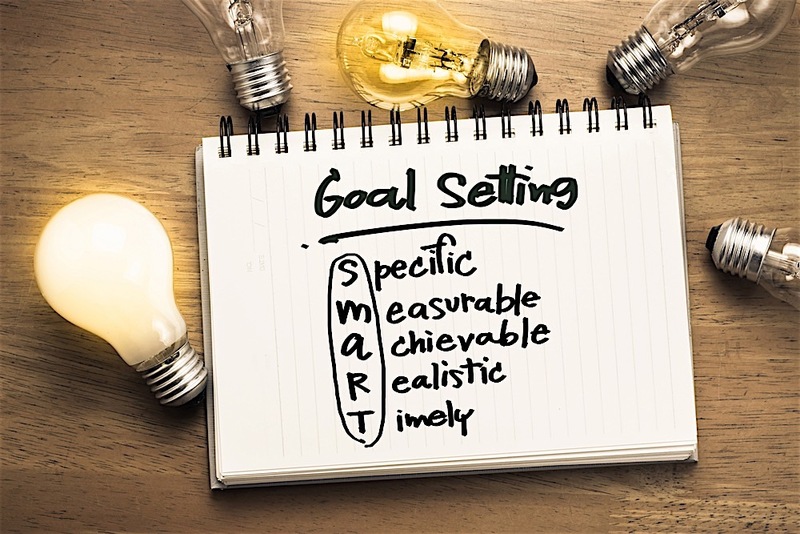 S.M.A.R.T is an acronym you can use to guide your real estate business goal setting. Fantasizing over your hopes and aspirations is far different from taking the time to sit down, put pen to paper, and set legitimate goals. Fantasies won’t produce results, while smart real estate business goals will take your business to new heights. Real estate goals come in all sorts of shapes and sizes, so don’t let anyone tell you yours are too big or small. That said, the best goals are those that move your business forward at a pace you are comfortable with. Small goals that can move things forward, for example, can be anything from driving by a predetermined amount of properties each month or talking to five new contacts a week. While relatively simple, these goals can have a lasting impact on the path your career takes. If you are more ambitious, however, you may be interested in setting larger goals. Since “larger” is a relative term, in may reference driving to more houses, or even take place over longer periods of time. Nonetheless, the truth remains: Regardless of how big or small your goals are, the most important thing is that they move the needle. What exactly am I trying to accomplish? How will achieving – or failing to achieve – this goal affect my business’ bottom line? What resources will I need to accomplish this goal? Who will need to be involved to successfully accomplish this goal? If you have a valid answer for each of the above questions, your goal will meet the “S” criteria in the S.M.A.R.T acronym. Goals that are measurable will help you stay motivated by giving you the ability to track your progress. If you set goals that have metrics and KPI’s, you’ll be able to assess how much you’ve improved and how much work still needs to be done. When you take the time to track your progress, you’re more likely to meet deadlines and you will feel more excited as the finish line approaches. When your goals are not measurable, you’re more likely to get off track and distracted. Let’s say you want to save up $20,000 by the end of the year. Instead of declaring such a broad statement, be more precise and say you will put an extra $1,000 into your savings account each week. This way, you can track exactly how much you’re conserving and can easily make up the difference if you accidentally skip one week. Am I financially ready to take on this goal? Have I given myself the necessary time to accomplish this goal? What constraints or hurdles do I expect to face when striving to accomplish this goal? If you take the time to address every negative scenario that could keep you from achieving your goal and subsequently identify the solution you will use to solve that potential problem – supposing that it arises – you’ll be ready to take on whatever obstacle stands in your way. Setting goals that are relevant is all about ensuring that said goals matter to the current state of your business efforts. Establishing that you want to be CEO of a commercial real estate firm someday while you’re still wholesaling properties in your local market part-time to pay the bills would not qualify as “relevant”. Creating long-term goals is important; and dreaming of a more successful future is a great way to stay motivated. But in terms of helping your business’ bottom line, relevancy plays a more crucial role. This last step is pretty straight forward: give your goals a deadline. It is one thing say you want to improve your real estate education this year, it is another to say you will attend either a networking event, REI club meeting, or industry conference two times per month for six months. When you create a target date for achieving each individual goal, you are more likely to remain distraction-free. What will you do today, next week, six weeks from now and 3 months from now in order to accomplish your six month goal? How will your six month goal help you achieve your one year goals? How will you one year goals help you achieve your five-year goals, and so on? In order to be successful, be sure to celebrate wins and milestones along the way to keep your energy tank on full. Setting “smart” real estate goals is the best way to achieve long-term success. Therefore, feel free to grab a pen and paper to write down your goals the next time you catch yourself daydreaming of a financially free future. That said, it’s not enough to simply write your goals down; you need to ensure each goal you set is specific, measurable, attainable, relevant and time-bound. The post 5 Real Estate Goals Every SMART Investor Should Set appeared first on FortuneBuilders.